This Aquarium Jigsaw Puzzle is for kids. Picture used in this Jigsaw Puzzle is 3D Wall painting in which fish appears to come out of frame. Solving this Jigsaw Puzzle will help you to become a better observer. In this Jigsaw Puzzle, four Jigsaw Pieces are cut from the Puzzle Image. Your challenge is to map these 4 pieces correctly in the Puzzle Image. Lets see if you can solve this Aquarium Jigsaw Puzzle? 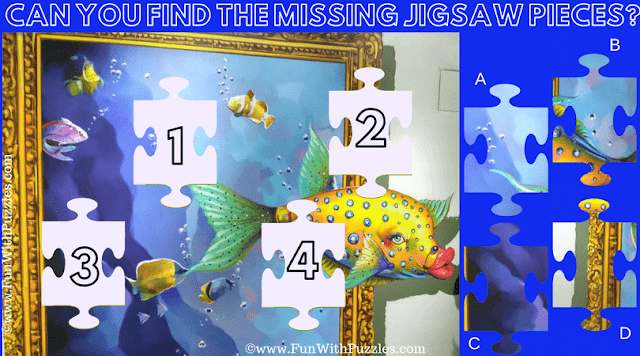 Answer of this "Aquarium Jigsaw Puzzle for Kids", can be viewed by clicking on answer button. Please do give your best try before looking at the answer.